Greece is well known for its production of tasty and healthy products, as well as local souvenirs and handicrafts. Of course, like in every tourist country, the best places to by good quality products are the small villages and islands. 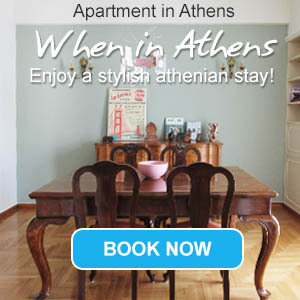 Nevertheless, Athens also has some few places where you can find what you are looking for. The fluffy looking and brightly coloured flokati rugs have been part of Greek tradition for centuries. They were handmade by the Greek shepherds from the mountainous areas of central and northern Greece, to warm themselves and their families during the cold winters. The way of fabricating flokati is to take the wool from their sheep and goats and turn it into clothes and rugs. The actual main production areas are around the town of Tripolis, in the Peloponnese, and the villages from around the towns of Trikala and Karditsa in Thessaly. Carpets are also a part of Greek history and specifically of Greek mythology. You will find a lot of references to the art of making carpets in the epics of Homer, Iliad and Odyssey, like the carpet that Penelope was weaving while waiting for her husband Odysseus to come back from Troy. Today, the most important centres of hand-weaving are in Lefkada, Anogeia and Metsovo. The good rugs and carpets for which Greece is famous can be found in the district of Plaka where a large range of shops offer a great choice of hand-made, industrial carpets and flokati rugs.If you would be interested to see beautiful hand made rugs and carpets, besides the ones in the shops, take a look at the National Organization of Greek Handicrafts, in Plaka. Greece is the country of quality leather. Athens has some places where you can buy some good items in a wide range of prices. The city also has a wide choice of shoes and bags. For expensive shoes and handbags, give a look to the boutiques of the Kolonaki district or on Ermou Street. The neighbourhood of Psiri is mostly dedicated to leather. And you will be able to find some nice and affordable hand made gloves, hats and handbags but only a few leather shoes (most of them are synthetic). For those famous Greek hand made sandals, go to Plaka or Monastiraki. In Plaka district, you will find the National Welfare Organization shops, the Traditional Greek Centre, the Hellenic Artisan Trades Cooperative or the Lyceum of Greek women. Those are the places where you will be able to admire knotted carpets, embroidered cushion covers, woodwork and much more. You will be able to buy some of there amazing handicrafts. The flea market of Monastiraki is also a place to discover great traditional handicrafts. Wonder around the small streets around the local market and Athinas Avenue to discover some little shops with rare items and great things to buy. If you like the sound of rebetika, a music sound that comes from the Greek emigrants who lived in Smyrna Asia Minor, you should consider buying, or at least admire a bouzouki, or any other of the many Greek traditional instruments. Plaka and Monastiraki are once again the places where you will be able to do that. Some shops specialize in handmade musical instruments and are worth a visit. They are located mostly in Stadiou Street or in the district of Pefkakia. You won't be able to find ancient Greek antiques to buy in Greece because it is illegal. The option would be to look for souvenir shops, where you can buy some imitations of ancient statues or pottery. Nevertheless, you still can discover some nice one or two century old antiques at the flea Marquet in Monastiraki, in the district of Kolonaki or at the Piraeus market. The famous jewellery stores, such as Ilias Lalaounis, Bvlgari or Kessaris, are located near Syntagma. You will also be able to buy some amazing jewellery in the other shops selling high quality gold, which are concentrated next by, on Stadiou and Voukourestiou streets. You will also have the option of buying reproductions of ancient Greek jewellery and ornaments in gold and silver in Museum shops such as the National Archaeological Museum outside the Acropolis, the Benaki Museum or the Cycladic Art Museum . This type of jewellery will be a wonderful souvenir and, of course, ornament. To find some more affordable silver jewellery you should look for the shops or the street vendors in Plaka and Monastiraki. Food in Greece is a very important issue. It is well known for its high quality products and unique taste. The coffee lovers should definitely experience the Greek coffee in one of the traditional kafenion in the center of Athens. To buy good Greek coffee, try to find one of the coffee shops around Syntagma or near Athinas Avenue. The Central Market on Athinas will fill your senses with amazing colours and odours. Here you will find a delectable range of culinary delights such as sweets, plump olives, good quality cheese, nuts, colorful spices, herbs, amber honey and bottles of the famous pure Greek olive oil. Street vendors selling fresh or roasted nuts (pistachio, almonds and walnuts) can be encountered at every corner of every street. Even though you should buy them in small specialized shops, you can of course find all of those products in the supermarkets. Athens products have gained great reputation providing excellent quality.